Hero Gustolette lives and works on one of the largest apple orchards in the world. Not only is Gustolettes an international supplier of apples, but also the heart of the small town. Each year Gustolettes earns many prizes and accolades for the biggest and tastiest apples. Their four prize apple trees are tended and nurtured daily and grow enclosed an eight foot fence secured by a padlocked gate. It is these very trees and the fruit they bear which are the cause of Hero’s heart being broken, first by Chubby and then twice by Milo. The morning before the annual apple show the Gustolettes awake to find someone or something has eaten their prize Gala apple. The gate remains locked and there are no sign of entry. Only two people hold keys to the enclosure, Chubby and Bertie Gustolette. It is Chubby’s job to oversee the running of the orchards, cultivate new breeds of apples and ensure their prize apples remain the winners they have always been. she is unable to find another explanation. Hero shuts herself away in her room for several weeks. She is heartbroken over losing Chubby and life seems pointless. In time, her broken heart heals and some years later she meets Milo Cruzin. Milo’s father owns Cruzin Tree Farms, located several towns away. Soon a loving relationship turns to marriage, but on the day of Milo’s proposal, he tells Hero the story of his first and only visit to Gustolette’s Orchards. While on one knee and holding Hero’s hand, Milo happily recounts how he jumped the fence surrounding four beautiful apple trees and enjoyed the best apple he had ever tasted. 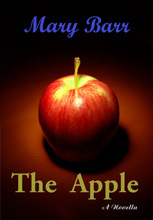 He continues to exude its virtues, telling her how big, red, crisp and juicy the apple was. Milo enjoyed it so much he saved the seeds. Milo doesn’t understand why Hero runs from his arms and never answers his calls.Once again, she shuts herself away from the world while she nurses her broken heart. Then, during a short business trip, Hero happens to visit the newest supermarket in town. There, amongst the apples, is a new breed and the name read’s ‘Hero’s gold’. She knows Chubby must have invented this apple. At that moment she knows she never stopped loving him. That night, alone in her hotel room, she spends hours searching for his telephone number or some clue that he is near, but finds nothing. The very next morning as she prepares to leave town she sees Chubby, tall and handsome, standing just inside the store talking to the owner. Hero’s heart misses a beat as the years fall away and she prepares to run to him, only to see, first one little girl, then two blond haired children leap into his arms; shortly followed by her once best friend. She is unable to move as she watches her friend move toward him and knows without a doubt that she is obviously Chubby’s wife! Hero thought her heart couldn’t break again, but it does. More years pass and after the death of Hero’s beloved father and sister, tragedy strikes Gustolette’s Orchards. The Gala apples contract blight and hundreds of acres of apple trees are lost. It is from the seeds Milo once stole, and the strong healthy Gala apple trees, he grew. That he is able to save Gustolette Orchards and ultimately reunite with Hero. Only, this time, they live happily ever after!